JADA BHARATA: There was a great devotee called Jada Bharata who was always meditating on the lotus feet of the Supreme Lord within his heart. To avoid becoming materially attached he behaved externally as if he was dumb, deaf and dull-headed. Jada Bharata was the youngest son of a very learned brahmana. His father tried to train him hoping that one day Jada Bharata would become a learned brahmana. But Jada Bharata did not learn anything. After his father passed away, his elder brothers, considering him unfit for any other work, engaged him in guarding the agricultural field at night. Desiring to have a son, a certain leader of a gang of dacoits decided to offer nara-bali to Goddess Kali. The scriptures do not permit offering a human being to Goddess Kali. But those in the mode of ignorance think that offering a human being to Goddess Kali is better than offering a goat. This is a concoction by such foolish people. The dacoit leader had found a man-animal for the offering who was brought before the Goddess. Somehow this man escaped, and the leader sent the other dacoits to search and bring him back. While searching for the man who had escaped, the dacoits came upon Jada Bharata guarding the field late in the night. Thinking that Jada Bharata was fit to be offered as a nara-bali, they caught him and brought him to their leader. Jada Bharata did not protest at all. The dacoits bathed Jada Bharata, gave him new clothes to wear, and fed him sumptuosly. Bringing him before Goddess Kali, they began chanting some mantras according to their concocted rituals. Finally, the leader took a very sharp sword to cut off the head of Jada Bharata for making the offering to Goddess Kali. Kali is also known as Vaishnavi because she is a devotee of the Supreme Lord. She could understand that a great Vaishnava was about to be killed by the dacoits. 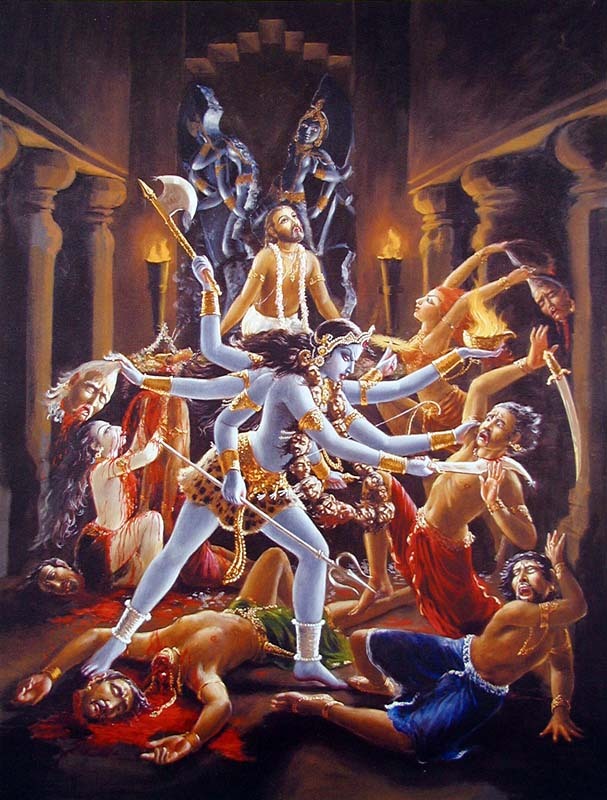 In order to protect Jada Bharata, Kali personally came bursting out of her deity form, snatched the sword and cut off the head of all the dacoits. What do the scriptures say about sacrificial offerings to Goddess Kali? Is animal killing condoned if the animal is offered in sacrifice to Goddess Kali? Srila Prabhupada gives clear answers to such questions in his various writings. MEAT EATERS ARE MURDERERS: In the Srimad Bhagavatam in a purport to verse number 1.7.37, Srila Prabhupada says: “According to Manu, the great author of civic codes and religious principles, even the killer of an animal is to be considered a murderer because animal food is never meant for the civilized man, whose prime duty is to prepare himself for going back to Godhead. He says that in the act of killing an animal, there is a regular conspiracy by the party of sinners, and all of them are liable to be punished as murderers exactly like a party of conspirators who kill a human being combinedly. The below-mentioned are all murderers, and all of them are liable to be punished by the laws of nature. - he who eats such cooked animal food. No one can create a living being despite all advancement of material science, and therefore no one has the right to kill a living being by one's independent whims. For the animal-eaters, the scriptures have sanctioned restricted animal sacrifices only, and such sanctions are there just to restrict the opening of slaughterhouses and not to encourage animal-killing. The procedure under which animal sacrifice is allowed in the scriptures is good both for the animal sacrificed and the animal-eaters. It is good for the animal in the sense that the sacrificed animal is at once promoted to the human form of life after being sacrificed at the altar, and the animal-eater is saved from grosser types of sins (eating meats supplied by organized slaughterhouses which are ghastly places for breeding all kinds of material afflictions to society, country and the people in general).” Animal killing is always sinful, but the flesh-eaters are allowed to eat meat only after performing restricted animal sacrifice.